Spiders and scorpions are replaced by a sabertooth tiger. I hope you are not scared of tigers. If you want to know, I just renamed the tiger texture file to replace the other two. 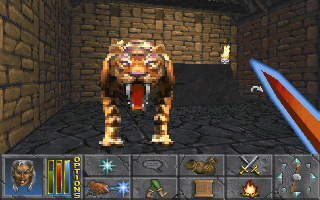 I noticed there was a spider replacer for arena but not daggerfall which is odd since they are a lot uglier in this one. Good evening.